"THE UNOFFICIAL GUIDE TO WALT DISNEY WORLD"
These links are intended for USA and all US$ purchasers. Guests from the UK please use the Keith Prowse ticket agency located further down the page. 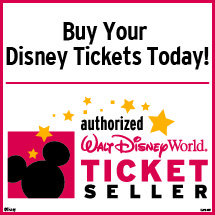 Please click on the image for all of your discount Disney Tickets and Orlando Theme Park Ticket needs. Plus book tickets to all the Orlando Dinner Shows. Orlando Florida's most recommended discount attraction ticket agency, selling millions of tickets around the world. All of our tickets are discounted, cheap and tax included with "No Hidden Fees". We have been in business for over 10 years and are family owned and operated. We take great pride in being able to offer our guests the lowest prices on any tickets to the Orlando Florida area theme parks and we have the best discounts and upgrades on Disney tickets anywhere! These links are intended for UK (British) purchasers. Guests from the USA please use the Official Ticket Centre located at the top of the page.